Hodie 3a vice lecta est Billa, intituled, "An Act for the more effectual securing and encouraging the Trade of His Majesty's Subjects to America; and for the Encouragement of Seamen to enter into His Majesty's Service." Purdon & al. made Respondents to Nagle's Appeal. A Petition of Penelope Purdon Widow, Relict, Executrix, and a Legatee and Devisee of the last Will and Testament, of Henry Purdon (late His Majesty's Serjeant at Law in His Kingdom of Ireland), deceased; and of Curthrope Clayton Esquire, Executor (after the Marriage or Death of the said Penelope Purdon) and Residuary Legatee and Devisee of the said Will, was presented, and read; praying, "That they may be made Respondents to the Appeal of John Nagle Esquire, they having been heard by Counsel before the Court of Exchequer in Ireland, from whence the said Appeal was brought; and that this House will order (as that Court did) that George Foot the Respondent may be required to attend at the Hearing before their Lordships." And thereupon the Agent for the Appellant as well as the Agent for the Petitioners were called in, and heard at the Bar. Ordered, That the Petitioners be made Respondents to the said Appeal, as desired; and have Liberty to put in their Answer thereunto. Bryce to amend his Appeal. 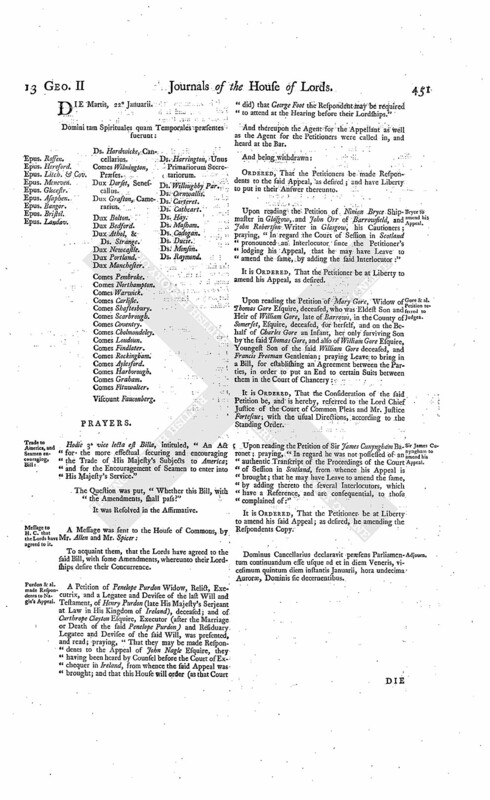 Upon reading the Petition of Ninian Bryce Shipmaster in Glasgow, and John Orr of Barrowfield, and John Robertson Writer in Glasgow, his Cautioners; praying, "In regard the Court of Session in Scotland pronounced an Interlocutor since the Petitioner's lodging his Appeal, that he may have Leave to amend the same, by adding the said Interlocutor:"
It is Ordered, That the Petitioner be at Liberty to amend his Appeal, as desired. Gore & al. Petition referred to Judges. Sir James Cunyngham to amend his Appeal. 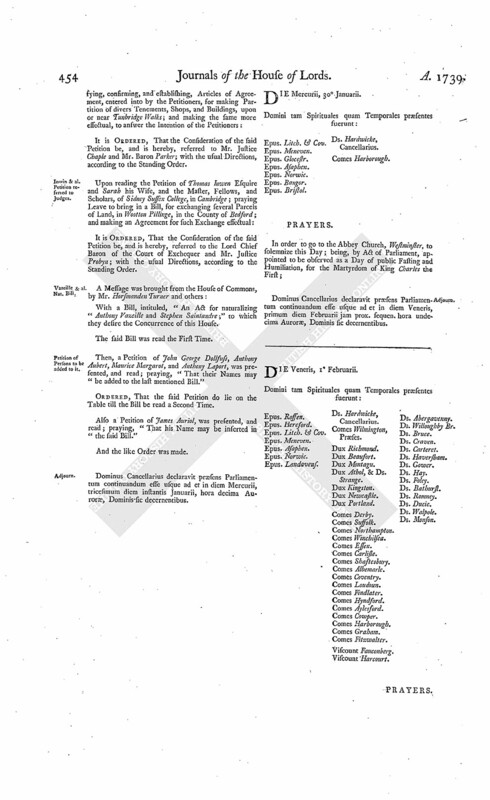 Upon reading the Petition of Sir James Cunyngham Baronet; praying, "In regard he was not possessed of an authentic Transcript of the Proceedings of the Court of Session in Scotland, from whence his Appeal is brought; that he may have Leave to amend the same, by adding thereto the several Interlocutors, which have a Reference, and are consequential, to those complained of:"
It is Ordered, That the Petitioner be at Liberty to amend his said Appeal; as desired, he amending the Respondents Copy. Dominus Cancellarius declaravit præsens Parliamentum continuandum esse usque ad et in diem Veneris, vicesimum quintum diem instantis Januarii, hora undecima Auroræ, Dominis sic decernentibus. Medlycotetal. Petition referred to Judges. Sir Robert Walpole, Leave for a Bill. Late E. of Halifax's Executors, Leave for a Bill. Robertson against E. Hoptoun & al. Upon reading the Petition and Appeal of Mr. Thomas Robertson; complaining of an Interlocutor, pronounced by the Commissaries of Edinburgh, the 9th of November last; as also of an Interlocutor of the Lord Minto, Ordinary for the Time upon the Bills; and likewife of an Interlocutor of the Lords of Session, of the 3d of January Instant, made on the Behalf of Henrietta Countess of Hoptoun, Charles Earl of Hoptoun her Husband, for his Interest, and George Marquis of Annandale; and praying, "That the said Interlocutors, so far as the same are complained of, may be reversed; and that such Relief may be given the Appellant as to the House shall seem meet:"
It is Ordered, That the said Earl and Countess and the said Marquis may have a Copy of the said Appeal; and put in their Answer or respective Answers thereunto, in Writing, on or before Friday the 22d Day of February next; and that Service of this Order on the Respondents Lawyers or Agents before the Court of Session be deemed good Service. D. Hamilton against E. Selkirk. Upon reading the Petition and Appeal of James Duke of Hamilton and Brandon; complaining of certain Interlocutors of the Lord Ordinary, of the 27th of July 1739, as in the said Appeal are particularly mentioned; and also complaining of an Interlocutor, or Decree, of the Lords of Session in Scotland, of the 10th of this Instant January, in so far as the said Lords thereby adhered to the said several Interlocutors of the Lord Ordinary, made on the Behalf of John Earl of Selkirk and Ruglen; and praying, "That the same may be reversed, and such Relief given the Appellant as to this House in their great Wisdon shall seem meet:"
It is Ordered, That the said Earl may have a Copy of the said Appeal; and put in his Answer thereunto, in Writing, on or before Friday the 22d Day of February next; and that Service of this Order on the Procurators or Agents of the said Earl be deemed good Service. Hamilton to enter into Recognizance for D. Hamilton. The House being moved, "That Alexander Hamilton Gentleman, may be permitted to enter into a Recognizance for the abovementioned Duke of Hamilton, on account of his Appeal:"
It is Ordered, That the said Alexander Hamilton may enter into a Recognizance for the said Duke, as desired. Upon reading the Petition and Appeal of William Veitch Writer to the Signet; complaining of several Interlocutors of the Lord Ordinary, as also of an Interlocutor of the Lords of Session in Scotland, of the 10th Instant, adhering to the former Interlocutors, made on the Behalf of John Carruthers of Holmains and his Guardians; and praying, "That the same may be reversed; and that the Appellants may have such Relief as to the House in their great Wisdom shall seem meet:"
It is Ordered, That the said John Carruthers and his Guardians may have a Copy of the said Appeal; and they are hereby required to put in their Answer or respective Answers thereunto, in Writing, on or before Friday the 22d Day of February next; and that Service of this Order on their Procurators or Agents before the said Court of Session be deemed good Service. Aylmer against Reed & al. and Ashworth against Chopping: Pleadings proved. 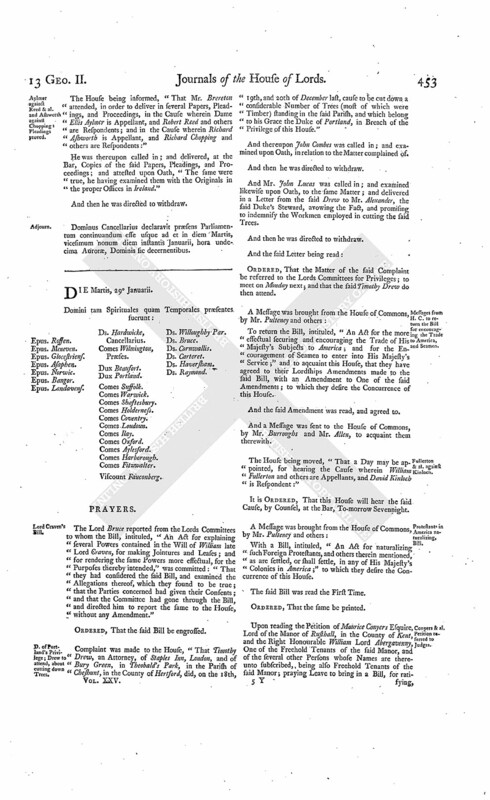 The House being informed, "That Mr. Brereton attended, in order to deliver in several Papers, Pleadings, and Proceedings, in the Cause wherein Dame Ellis Aylmer is Appellant, and Robert Reed and others are Respondents; and in the Cause wherein Richard Ashworth is Appellant, and Richard Chopping and others are Respondents:"
He was thereupon called in; and delivered, at the Bar, Copies of the said Papers, Pleadings, and Proceedings; and attested upon Oath, "The same were true, he having examined them with the Originals in the proper Offices in Ireland." Dominus Cancellarius declaravit præsens Parliamentum continuandum esse usque ad et in diem Martis, vicesimum nonum diem instantis Januarii, hora undecima Auroræ, Dominis sic decernentibus. The Lord Bruce reported from the Lords Committees to whom the Bill, intituled, "An Act for explaining several Powers contained in the Will of William late Lord Craven, for making Jointures and Leases; and for rendering the same Powers more effectual, for the Purposes thereby intended," was committed: "That they had considered the said Bill, and examined the Allegations thereof, which they found to be true; that the Parties concerned had given their Consents; and that the Committee had gone through the Bill, and directed him to report the same to the House, without any Amendment." D. of Portland's Privilege; Drew to attend, about cutting down Trees. Complaint was made to the House, "That Timothy Drew, an Attorney, of Staples Inn, London, and of Bury Green, in Theobald's Park, in the Parish of Cheshunt, in the County of Hertford, did, on the 18th, 19th, and 20th of December last, cause to be cut down a considerable Number of Trees (most of which were Timber) standing in the said Parish, and which belong to his Grace the Duke of Portland, in Breach of the Privilege of this House." And thereupon John Combes was called in; and examined upon Oath, in relation to the Matter complained of. And Mr. John Lucas was called in; and examined likewise upon Oath, to the same Matter; and delivered in a Letter from the said Drew to Mr. Alexander, the said Duke's Steward, avowing the Fact, and promising to indemnify the Workmen employed in cutting the said Trees. Ordered, That the Matter of the said Complaint be referred to the Lords Committees for Privileges; to meet on Monday next; and that the said Timothy Drew do then attend. Messages from H. C. to return the Bill for encouraging the Trade to America, and Seamen. 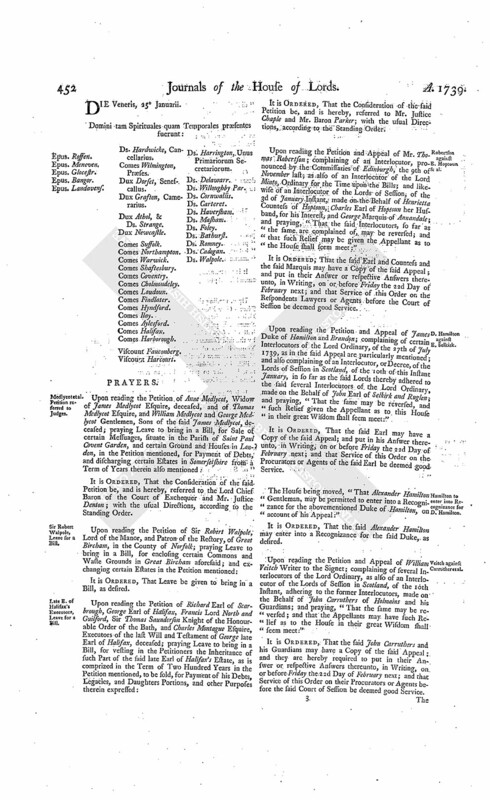 To return the Bill, intituled, "An Act for the more effectual securing and encouraging the Trade of His Majesty's Subjects to America; and for the Encouragement of Seamen to enter into His Majesty's Service;" and to aqcuaint this House, that they have agreed to their Lordships Amendments made to the said Bill, with an Amendment to One of the said Amendments; to which they desire the Concurrence of this House. And the said Amendment was read, and agreed to. And a Message was sent to the House of Commons, by Mr. Burroughs and Mr. Allen, to acquaint them therewith. Fullerton & al. against Kinloch. The House being moved, "That a Day may be appointed, for hearing the Cause wherein William Fullerton and others are Appellants, and David Kinloch is Respondent:"
It is Ordered, That this House will hear the said Cause, by Counsel, at the Bar, To-morrow Sevennight. With a Bill, intituled, "An Act for naturalizing such Foreign Protestants, and others therein mentioned, as are settled, or shall settle, in any of His Majesty's Colonies in America;" to which they desire the Concurrence of this House. Conyers & al. Petition referred to Judges. Inwin & al. Petition referred to Judges. It is Ordered, That the Consideration of the said Petition be, and is hereby, referred to the Lord Chief Baron of the Court of Exchequer and Mr. Justice Probyn; with the usual Directions, according to the Standing Order. With a Bill, intituled, "An Act for naturalizing Anthony Vazeille and Stephen Saintandre;" to which they desire the Concurrence of this House. Petition of Persons to be added to it. Then, a Petition of John George Dollfuss, Anthony Aubert, Maurice Margarot, and Anthony Laport, was presented, and read; praying, "That their Names may be added to the last mentioned Bill." Ordered, That the said Petition do lie on the Table till the Bill be read a Second Time. Also a Petition of James Auriol, was presented, and read; praying, "That his Name may be inserted in the said Bill." Dominus Cancellarius declaravit præsens Parliamentum continuandum esse usque ad et in diem Mercurii, tricesimum diem instantis Januarii, hora decima Auroræ, Dominis sic decernentibus. Dominus Cancellarius declaravit præsens Parliamentum continuandum esse usque ad et in diem Veneris, primum diem Februarii jam prox. sequen. hora undecima Auroræ, Dominis sic decernentibus.